If you’re unsure how to cook Brussels Sprouts, we have a classic recipe for you. 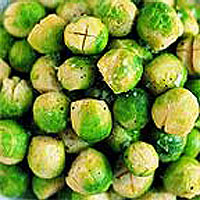 Simple to follow and ready in under 30 minutes for perfect Brussels sprouts this Christmas. Fill a large pan with cold water, add a little salt and bring to the boil. Meanwhile, prepare the sprouts by discarding any tough, coarse outer leaves. Using a sharp knife, cut a deep cross into the base of each sprout: this will enable the centre to cook without overdoing the outside. Add the sprouts to the pan of boiling water, cover and boil for 4-5 minutes until just tender. Drain well, add the butter, season with black pepper and sea salt and serve immediately. Prepare the sprouts the night before and store in a plastic bag. Brussels do not benefit from being kept warm, so cook them at the last minute and serve immediately, as they quickly lose both their colour and texture.